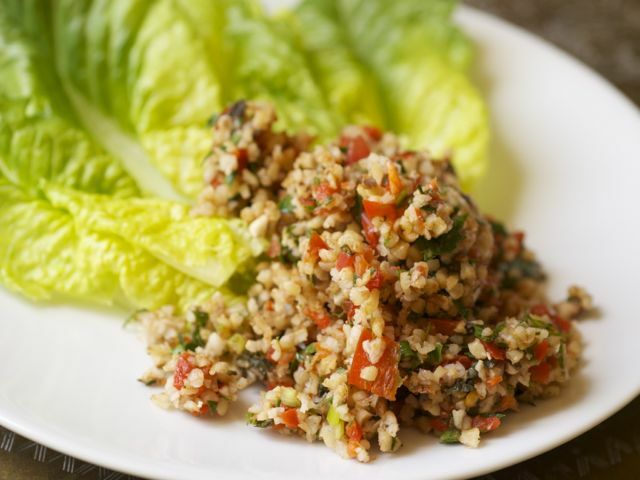 This is a lovely herby, spicy bulgur-wheat dish from Turkey, similar to tabouli. It's the piquant dressing that makes it special. Despite the lengthy list of ingredients, it is quick and easy to make. When my greenhouse tomatoes are in full swing, I often double the quantity of tomatoes, leaving out the peppers. And you can make a very respectable version using couscous instead of bulgur wheat. Place the bulgur wheat in a large, heatproof bowl. Pour over ¾ cup boiling water, stir, then cover and leave for 20 minutes. The bulgur should retain some bite at this stage. Meanwhile, make the dressing. Mix together the lemon juice, tomato paste, pepper flakes, cumin, paprika, salt, and pepper, then whisk in the oil. Pour the dressing over the warm bulgur and stir well. Let cool completely. Preheat the oven to 350 degrees. Put the walnuts in a pie pan and toast in the oven for 5 to 7 minutes, until fragrant. Let cool and then chop coarsely. Meanwhile, core, seed, and dice the tomatoes. Slice the green onions finely and cut the peppers into dice. Once the bulgur is cool, combine it with the tomatoes, peppers, green onions, walnuts, and herbs. Let stand for at least 20 minutes so the flavors can mingle, then taste and adjust the seasoning, adding more salt, pepper, and/or pepper flakes if you like. Serve with pita bread and/or lettuce leaves. Variation: Zucchini kisir. Omit the green and red peppers. Slice, season, and quickly fry about 1 pound small zucchini, then add them to the salad with the tomatoes. Very firm, fresh young zucchini can be added raw — chop them into small dice rather than slice. Culinate editor's notes: You can replace the bulgur with 1 cup millet, simmered for about 20 to 30 minutes in 3 cups of water. Instead of toasting the walnuts in the oven, you can toast them in a hot, dry skillet on the stove (a cast-iron pan works great). Stir them every minute or so to prevent burning.